already quite hard to say goodbye after one week...i had a great time here and definitely recommend it to other travellers. Nice and cozy place to stay! Good bye for now and best wishes for those helpers to come! 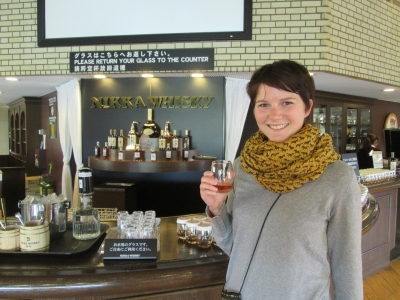 here are the breaking news from Otaru! After my first post here, it rained a lot in the following two days, so not that much to do outside (literally nothing, to be honest). 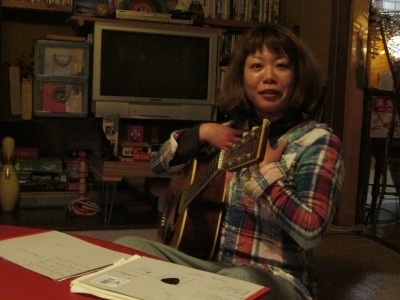 But we played guitar and enjoyed the music from Mayumi-san ;-) She does a great job! I decided to visit one of the nearby onsens, located in the Kourakou Hotel. Easy to get there, just hop on Bus Nr. 13 at the Otaru Bus Terminal, it takes about 10 to 15 minutes to get there (fare one way: 220 Yen). Entrance fee for the onsen is 800 Yen - of course you can get cheaper ones, but i have to say, this one was worth the money (now a steambath/sauna and would be perfect). Not too big, looking quite new, with a nice outdoor bath - when you count the place where you can sit on a kind of a bank, with hot water running down your back and your feet in hot water, there are actually two baths outside. Although it was 1. weekend 2. bad weather and 3. late afternoon, i expected it to be crowded, but suprisingly i was alone there for most of the time. Veeeery relaxing! Think i am gonna go again. Next day, finally, the weather was changing, with a cloudless sky, bright sunshine and very convenient temperatures. I took the day for making a daytrip to Yoichi, a town 20 minutes with the train from Otaru station (one way 360 Yen). Why get there? 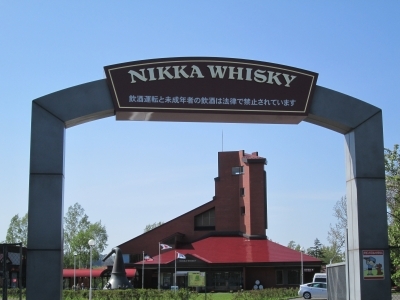 Well, it got famous for its Whisky Distillery, the Nikka Distillery is i think the most popular one. The distillery ground seems more like a small village, with museums, displays in brick houses. I liked the one where the whisky is produced, with fire under the giant pots. The smell was devine!! In the main building you can try a sample of 3 kinds of whisky they produce here, and the best is: it's for free (as the distillery itself). My opinion: the first one - think it was single malt - burnt like battery acid in my throat, hoooooolyyyy!! The second one was MUCH better, smoother taste. I especially liked that one and would buy it. The third one was a mix of whisky and apple juice, which i filled up with soda and ice. Very refreshing! After getting drunk - no, just joking, takes a little bit more than that ;-) - i walked around town, along the riverside with some really nice views on the surrounding mountains and blooming trees. 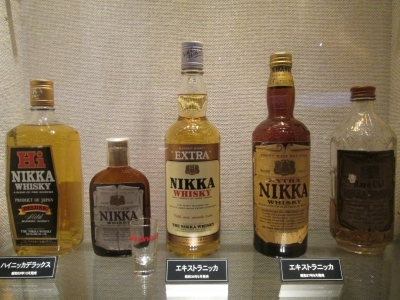 If i got that right (museum display was 95% in Japanese only), the founder decided to settle down in Yoichi because the environment and the climate conditions came close to that one in Scotland, where he learned how to produce whisky. Well, after all, i think that wasnt a bad decision at all! Nice daytrip to Yoichi! 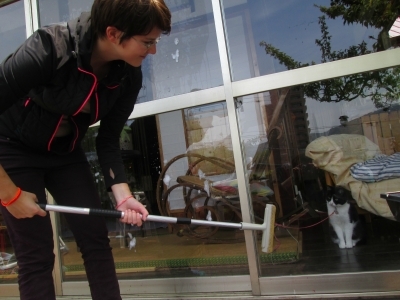 This morning, Mayumi-san and me were cleaning the windows from the veranda and making fun of Momo-san (the cat), who was chasing after the cleaning mop and watching our actions quite suspiously. I already leave day after tomorrow, but i will write a goodbye post before - promise! 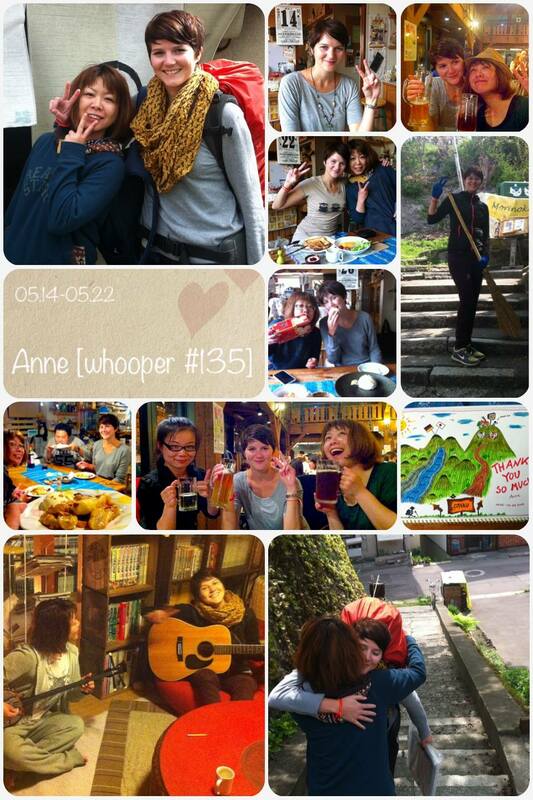 my name is Anne, 26 years old, from Munich in Germany, and i am on my worldtrip since November 2013. After i fell in love in Japan on a visit in march, i decided to come back after a short trip to Korea and stay for a longer term. Luckily, there a places like Morinoki Hostel which offer free accommodation in exchange for a couple of hours per day. In a quite expensive country like Japan, that saves you from bursting into tears every time you check your bank account. 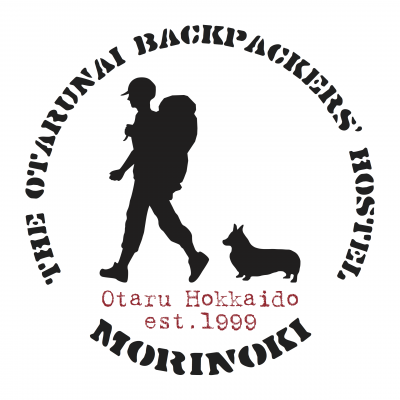 After spending three weeks in wonderful Korea and two days in Sapporo, i finally arrived in Otaru on 14 May at 9.30 in the morning by train, heading for Morinoki Backpackers Hostel. 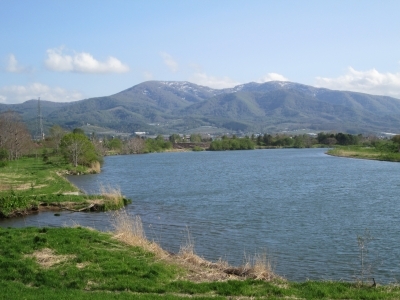 Very easy to find from Minami-Otaru-Station, maybe 10 minutes walk. Everybody - incl. cat and dog - gave me a warmly welcome, showing me around the place. Let's face it: this place feels like anything, but not like an ordinary "hostel". 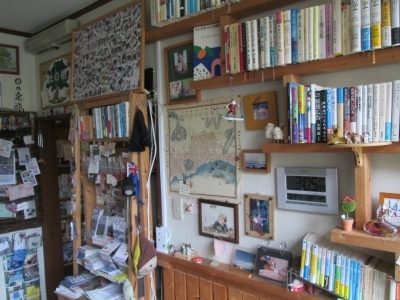 I found the most japanese guesthouses i stayed in general cozy, but this one belongs to my favourite ones (and i don't write that because i feel that i have to). No work for me at this day (phweeee...), so i had enough time for a stroll through Otaru. Weather was not too bad, but a little bit more sunshine would have been great,though. My impressions: many schoolkids in the streets. Expensive ice cream ;-) Shops selling glass souvenirs. "Marine" feeling because of the harbour and the boats and small ships (in this order). 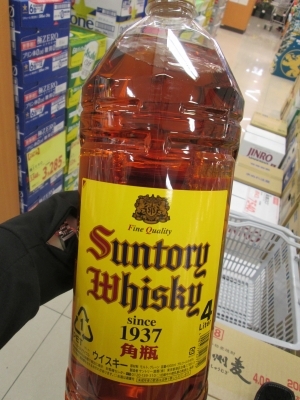 Unfortunately it started to rain once i was out again, so i headed quickly for the supermarket (anyone in need for a 4-litre-whiskey-bottle???) to buy some food for the next days and got home again. 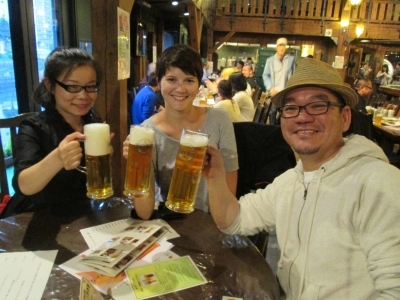 When Masa was asking me wether i like beer because there's a beer party going on tonight, i was expecting anything, but not a oktoberfestlike Braeustueberl with Japanese people cheering up "Oans, zwoa, g'suffa!" (which means "one, two, drink" in german with bavarian accent). I live in Munich, home of the Oktoberfest, so i can say that this place is a good substitute for people like me who miss their hometown from time to time ;-) But nothing comes close to the REAL Oktoberfest of course (a word only foreigners use by the way, the bavarian people call it "Wiesn"). Anyway, we had a great time there with "all-you-can-drink", delicious food and traditional bavarian music playing in the background. A highly recommandable place to go out for a drink in Otaru, and the Otaru beer tastes really good (the brewing master is from Germany and lives in Otaru for 20 years, a nice guy!). To my very big suprise, we all made it out of bed the following morning quite early, about 7.30. After amusement comes work, so i i did my part that the place keeps looking tidy - cleaning restrooms, dorms, floor, outside and so on. Think everybody knows how to clean from home, so it is work i am used to. Plan for the next days: visiting onsen and making daytrips to other nice places in this area. Looking forward to it!